I confess: the only Final Fantasy game I’ve played is FF4, but I’m pretty familiar with the music in the series. I need to spill my love for this gorgeous album that I finally got my hands on. 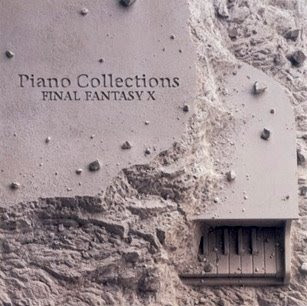 The Final Fantasy Piano Collections is a series of piano arrangements from the games. These arrangements sometimes adhere closely to their original inspiration, and other times they take on their own adaptations. The “Besaid Island” theme from the game has an ambient melody that repeats itself. This imaginative piano version flips that motif inside out, transforming those few notes into a lovely musical piece. The gentle charm of “Rikku’s Theme” is brought to the higher ranges of the piano with hints of bossa nova. The planing chords of “Song of Prayer” are reminiscent of the mythical splendor of “The Sunken Cathedral” by Debussy. I have the old FF concert (2002/20/02) and a few other albums, but I haven't heard much from this new one. FF4 ..as in English FF4 (which is like Japanese FF1 or something?) It's been a while since I heard these songs. You should do an entry on how each songs evolved throughout FF series. A lot of songs are arranged very differently and used in different situation, like how Aerith's theme becomes Timber Owl in FF8 (they were totally opposite in nature). THE VIDEOS DON'T WORK. curses.